Suellen and Dom Balestra with the sign that they will place on their conserved land in Lebanon. Amid the rain, fog and slush of the past several days, there wereÂ bright spots for land conservation! Landowners in Hartland and Lebanon donated conservation easements protecting over 300 acres of fields, forests and natural areas. 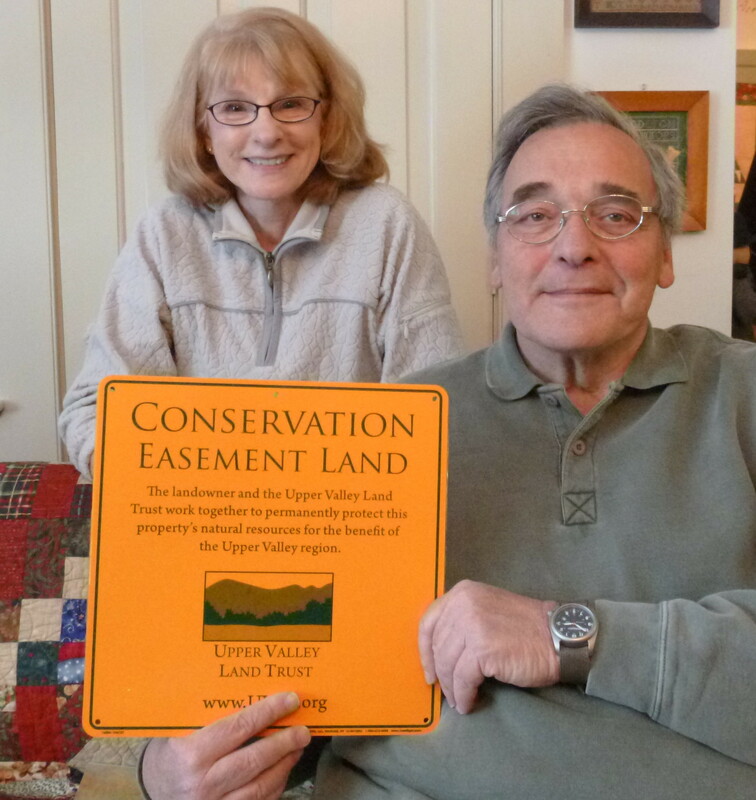 Neighbors and friends came together in Lebanon on Friday, December 20, to witness the signing of a conservation easement that will protect Dom and Suellen Balestra’s 107-acre hill farm forever. 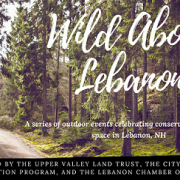 The Balestra property was one of the earliest to be settled in Lebanon and was once part of a thriving area of working farm and forest lands. 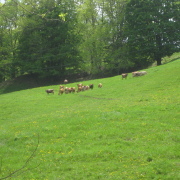 In the past two decades over 30 new houses have been developed in the pastures and woods nearby. The conservation easement donated by the Balestras is a critical addition to buffer and support a large block of wildlife habitat and forest stretching up to Signal Hill and Mount Tug. In Hartland, Gayle Davis finalized a conservation easement that protectsÂ 199 acres that includes a large sugarbush, pastures, ponds, and shoreline on Lull’s Brook. 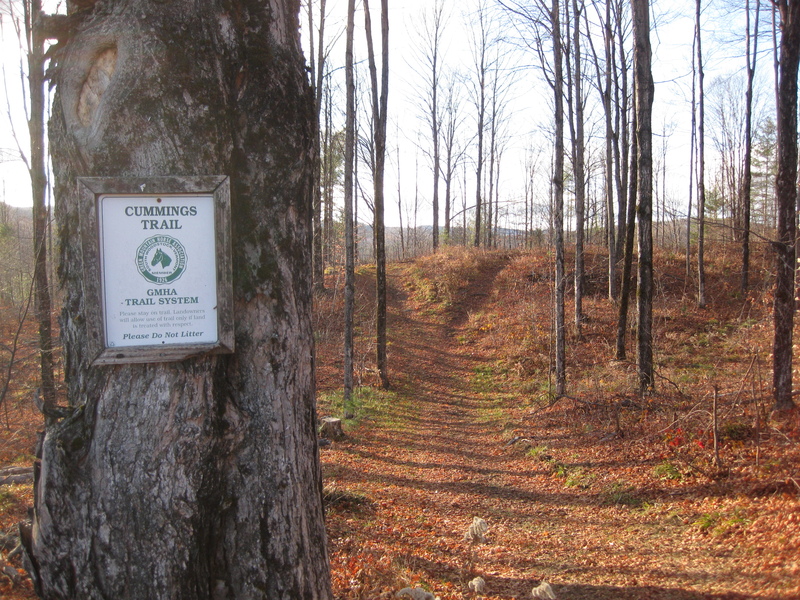 The Green Mountain Horse Association maintains the Cummings Trail. The farm is adjacent to the 201 -acre Norman property conserved by UVLT in 2003. Many trails on the property are used for horseback riding. The Green Mountain Horse Association maintains some of the trails as indicated by signage along primary routes within the property and along some boundaries which are discontinued roads.Â Gayle Davis also allows mountain bikes, hikers, skiers etc. to enjoy the property. Her conservation easement provides permanent protection for four significant trail segments. The view above is looking south from Gayle Davis’ hilltop meadow toward Mt. Ascutney. In the center of the closer horizon line is Thorny Hill Farm, conserved with UVLT by John and Sue Greenall.